Romans 9:20-21 – But who indeed are you, a human being, to argue with God? Will what is molded say to the one who molds it, “Why have you made me like this?” Has the potter no right over the clay, to make out of the same lump one object for special use and another for ordinary use? To start writing this blog, I decided to research a little bit about how pottery is made on Wikipedia (the most trusted source, I’m sure). There are many stages the potters put the clay through as they create their pieces. Greenware refers to unfired objects. Clay bodies at this stage are in their most plastic form. They are soft and malleable. Hence they can be easily deformed by handling. When we first learn about Jesus, and come to know Him as our personal savior, we can be like the greenware. We’re a bit soft and malleable. The devil really works on us during that time to try to deform us and make us seem unusable. We haven’t had our faith tested much, but we don’t know a lot yet either. We need us some learnin’! It’s important in those early stages of our faith that we remain in the word of God. We don’t want to be led astray or “deformed” by not knowing the truth about our Lord. People will want to argue, distract you or led you back to a not so great lifestyle. But we’re not only pliable and malleable to people and the devil. It is also often our greatest time of growth in our faith and knowledge. It is as if someone has just turned on the lights. We can start to see our purpose and we can start to understand God’s plan for our future. Plans to include us in His heavenly kingdom. This is an interesting stage of our faith, maybe we’ve been going to church for a while, we’ve started listening to some Christian music, and we don’t hate it. We like it when one preacher preaches, but not when the other one does. We want things to be routine, comfortable. We’re still a little new in our faith, so change is sometimes confusing. We’re not sure what is allowed and what isn’t, so we struggle with our self concept, and again must turn to scripture to find those answers. This is also the time you start to realize that all your gifts and talents can be used to the Lord’s Glory. Bone-dry refers to clay bodies when they reach a moisture content at or near 0%. It is now ready to be bisque fired. We’ve become comfortable in our faith. We’re sure that God loves us and that we love Him. Life seems really good during this stage of our faith. The word seems clear to us, we’re not worried about being led astray. We’re even pretty sure we’re ready to talk with our friends and relatives about what we believe. It’s a good time! But there is more coming, and you must arm yourself with the word of God once again. Biscuit  refers to the clay after the object is shaped to the desired form and fired in the kiln for the first time, known as “biscuit fired”. This firing changes the clay body in several ways. Mineral components of the clay body will undergo chemical changes that will change the colour of the clay. This stage of our faith may not be much fun. We may be strong in our faith, joined a Bible study or two and may be growing in knowledge. We try to surround ourselves with like-minded people, and are in the word almost everyday. We remember to spend time in prayer. Then why is this time so hard? Because life is hard. Your mom gets cancer, and suddenly you’re wondering where God is in all of this. Your daughter get’s pregnant, even though you pray for her every day. Your husband has a drinking problem, and you’re feeling neglected and dejected. You still remain in the word. You cling to the Lord with all your might. Almost every moment seems like a prayer. You’re not sure you could make it without the Lord. Actually you’re sure you couldn’t. Your life is hard, but your relationship and dependency on the Lord is growing. You’re starting to see some big changes in your life. You will never be the same. People are going to be able to see the change in you. Glaze fired is the final stage of some pottery making. A glaze may be applied to the bisque form and the object can be decorated in several ways. After this the object is “glazed fired”, which causes the glaze material to melt, then adhere to the object. The glaze firing will also harden the body still more as chemical processes can continue to occur in the body. After we’ve been through some rough times and found that we can rely on God, our behavior starts to change. We start to do things with God in mind. We put Him first and try to give Him the glory at every turn. You may still go through some hard times. Your health may be failing, your spouse might have died, and your children live far away. But the relationship with you and the Lord continues to grow. He brings you a peace that surpasses all understanding. We’re still being made solid in the Lord, and we’re beginning to reflect the work of the Lord in our everyday life. You might find that more people seem to know you’re a Christian, and they’re not surprised. 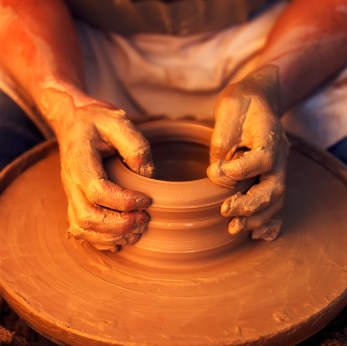 I don’t know that we all go through all of these stages or that we don’t go through them a few times, but I liked the definitions of the clay and they helped me to think about God as the Potter. God has a plan for you. Before He formed you He knew how you were going to be useful. He knew in what ways you would reflect His glory. In the very beginning he formed you. He intentionally made you with all the gifts, talents and attributes you need and want. He used the times in your life, the home you were raised in, the schools you went to and the people you met to help mold you into who He intended. This part of our verse really gets to me. There have been so many times in my life that I have done a lot of self-loathing. I didn’t like who I was and didn’t think I had much to offer the world. But God does have a plan for us. We are to bring Him glory. Our lives should be lived out as a reflection of Christ in us. Each thing that happens to us, good or bad, is an opportunity for us to glorify God. We can point to Him as the source of all blessings, and the comforter of all pain. God molded you and me to be what He wanted us to be. We’re His workmanship. So whether you feel malleable, in the fire or adorned, remember the one who formed you. He has a plan for you. A plan to prosper you and not to harm you.